任媛, 苏新明, 陆常玲, 李朋, 李孟露, 康健. 组蛋白去乙酰化酶6在慢性哮喘小鼠肺组织中的表达形态[J]. 中国医科大学学报, 2018, 47(9): 788-791, 802. REN Yuan, SU Xinming, LU Changling, LI Peng, LI Menglu, KANG Jian. Histone Deacetylase 6 Expression Pattern in the Lung Tissue of Chronic Asthmatic Mice[J]. Journal of China Medical University, 2018, 47(9): 788-791, 802. Abstract: Objective To investigate the expression pattern of histone deacetylase 6(HDAC6) in the lung tissue of chronic asthmatic mice. Methods BALB/C mice were divided into control and asthma groups(n=12 per group). Ovalbumin sensitization and excitation were used to construct the chronic asthma model. Lung tissue samples from each group were collected 24 h after the last challenge test. 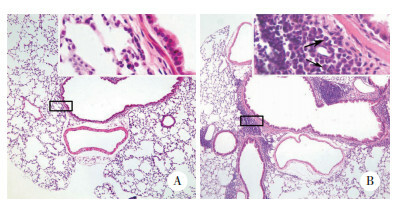 Immunohistochemistry was performed to determine HDAC6 localization in lung tissue. 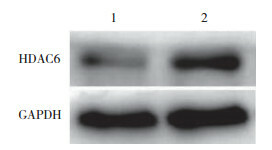 Western blotting was used to quantitatively analyze HDAC6 expression. Colorimetry was used to detect HDAC6 activity. Results Compared to the control group, the expression and activity of HDAC6 increased significantly in the lung tissue of the asthma group(P < 0.05). HDAC6 expression was observed in airway epithelial cells, airway perivascular inflammatory cells, smooth muscle cells, and alveolar inflammatory cells of the asthma group, whereas it was expressed negligibly in lung tissue of the control group. 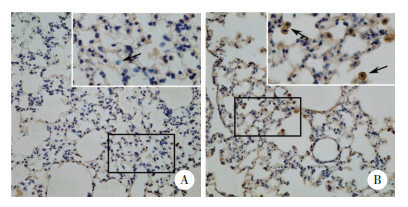 Conclusion HDAC6 expression, localization, and activity in lung tissue changed to varying degrees during asthma pathogenesis.